To find the root cause of an error or unexpected results in a strategy rule, you can enable debugging for proposition filters. Use this feature for test purposes only because it negatively affects system performance. In the Records Explorer of Designer Studio, click Decision > Strategy. 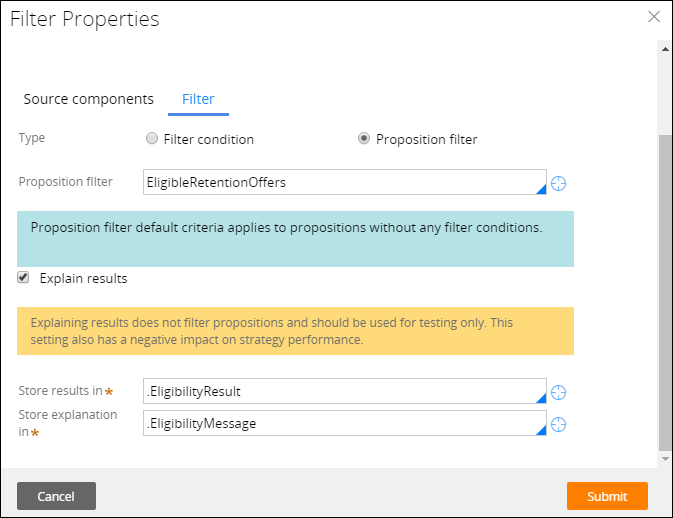 Click the strategy rule that contains the proposition filter rule that you want to troubleshoot. On the Strategy tab of the Strategy form, double-click the Filter shape that references the proposition filter rule whose configuration you want to review. In the Filter Properties dialog box, select the Explain results check box. In the Store results field, press the Down Arrow key and select the property that stores the output value that the proposition filter returns. This property type must be TrueFalse. In the Store explanation in field, press the Down Arrow key and select the property that stores the values of propositions that the proposition filter evaluates at run time. This property type must be Text. Test the strategy by configuring a single case test run or configuring a batch case test run.